God, I Have Issues: 50 Ways To Pray No Matter How You Feel Review"50 Ways" is Fr. Thibodeaux's response to a need of his own that is certain to resonate with others. Over time he has wished in vain for a resource that would help him incorporate his current mood or a common situation into his conversations with God, who seems to be inviting him to do so. Thus, he decided to write that resource himself. The table of contents lists a series of situations and emotions. The body of the book contains a reflection on each topic, always introduced by a scripture passage and followed by a list of passages for further reading, prayer pointers, related entries, and "words to take with you." The value-added segment comes in the last few pages, which contain an index of themes and extensive listing of alternative emotions and situations in an "If you're feeling"/"Look up" format. 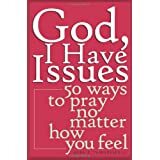 Want to learn more information about God, I Have Issues: 50 Ways To Pray No Matter How You Feel?